Institutional economics has been a major part of economic thought for the whole of the twentieth century, and today remains crucial to an understanding of the development of heterodox economics. The two principal publications that founded the school were Veblen's The Theory of the Leisure Class and Commons's A Sociological View of Sovereignty, both published in 1899. As a tribute to these two seminal works, Warren Samuels has assembled an exceptionally prestigious international group of scholars to produce this landmark volume celebrating the centenary. 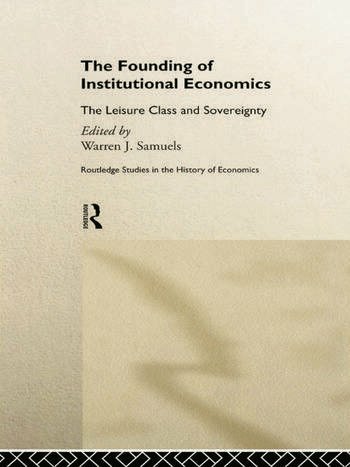 The chapters assess the work of Veblen and Commons and their influence on the school of institutional economics from a variety of theoretical perspectives. The contributions on Veblen appraise his anthropological analysis of consumption habits of American households from sociological, linguistic and feminist points of view. Conversely, the essays on Commons's work focus on the concepts of property, power and the relationship between legality and economics.